"What we found is that there are some cancer cells that respond to softness as opposed to stiffness," said Michelle Dawson, an assistant professor in the School of Chemical and Biomolecular Engineering at the Georgia Institute of Technology. "Ovarian cancer cells that are highly metastatic respond to soft environments by becoming more aggressive." 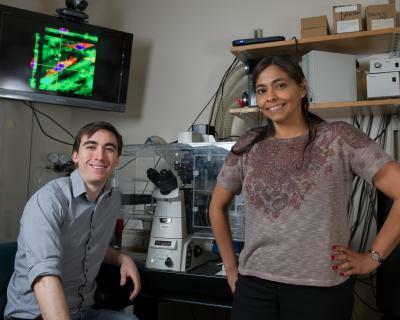 Professor Michelle Dawson and graduate student Daniel McGrail used traction force microscopy to measure the forces exerted by cancer cells on soft and stiff surfaces. "All the behaviors that we associate with breast cancer cells on these more rigid environments are flipped for ovarian cancer cells," Dawson said. The researchers used techniques that haven't been traditionally used in the study of ovarian cancer. They measured the force exerted by the cells by tracking the displacement of beads in the environment around the cells. The researchers found that the metastatic cells increased their traction forces – used to generate motion – by three-fold on soft surfaces, but no such change was present in the less aggressive cells. "We think the behavior that metastatic ovarian cancer cells exert on these soft surfaces is representative of the mechanical tropism that they have for these softer tissues in the gut," Dawson said. "We're trying to find out whether there is some internal programming that leads to this aggressive behavior," Dawson said.